Diego Velazquez, 1599-1660, one of Spain’s famous artists in art history was influenced by Caravaggio is his early works of art. He painted one of his most famous paintings "The Water Carrier of Seville", in 1619 aged twenty. Velazquez’s artistic interest at the time was 'naturalism', devoted to the true representation of nature regardless of the customary practices of the times. "The Water Carrier of Seville" is a famous painting of an older man selling water in Spanish Seville. Diego Velazquez uses the light into darkness art principle of Leonardo da Vinci and Caravaggio; adding the balanced circular highlight composition of Gruenwald's "Crucifixion". Our eye enters into the painting through the boy's white collar on the left. We then move to the head of the water carrier, to the hole in his garment, to his white sleeve, then to the highlight of the earthenware jug, to the smaller jug on the table, over to the water glass, and finally back again to the boy's white collar. Velazquez's representation of nature is so real that his objects seem to really exist in his famous paintings. As with Anthony van Dyck's portrait art, Velazquez had the ability to render the personality, dignity, spirit, and personality of the sitter. From 1621 to 1665 Velazquez was appointed court painter to Philip IV of Spain where he mainly painted art portraits of the royal family. Meeting Rubens in the Spanish court helped Velazquez discover Titian's paintings among the kings collection. Another Diego Velazquez's painting is "Pope Innocent X painted in 1650, using Caravaggio’s light to dark art technique. Velazquez loosely paints the Pope's contrasting, highly highlighted white clothing, against the cool reflective red sheen jacket. The result creates surface tension matched by the Pope's concentrated gaze directly at the viewer. Adding further to the aristocratic and perceptive authority of the Pope X is his head framed by the reflective edges of his throne-like chair. All in all these characteristics are qualities of Baroque art painting. In 1656, Diego Velazquez painted one of his famous paintings in art history Las Meninas. The painting is a portrait of Princess Margarita and her maids, but also is an art painting recognizing Velazquez, the court painter, and a Knight in the Order of Santiago. Velazquez inserts a full-length portrait of himself standing behind a large easel, wearing the cross symbol of the Santiago Order. Velazquez inserts a full length portrait of himself into the painting standing behind a large easel, wearing the cross symbol of the Santiago Order; rendering the painting we are looking at. Diego Velazquez shows his interest in light, direct and reflected, as it comes into the low foreground right side of the painting. Instead of a Caravaggesque dark background, he shows a new light source from behind an open door with light reflecting off the door. He is rendering the art painting we are now looking at. 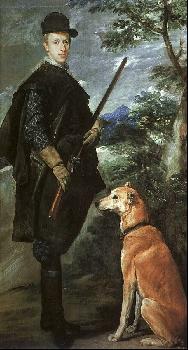 Velazquez shows his interest in light, direct and reflected, as it comes into the low foreground right side of the famous painting. Instead of a Caravaggesque dark background, he shows a new light source from behind an open door reflecting directly off the door. Diego Velazquez uses the same compositional artistic balance as the "Water Carrier", only this time it is an elliptical oval following the white highlights around the room that includes the open back door, the reflection off the portrait of the King and Queen hanging on the back wall, and the silver white highlight of Velazquez's own sleeve. Other famous artists of the Baroque art period are Anthony van Dyck and Peter Paul Rubens. To view the entire gallery of Diego Velazquez paintings, click here.